Anyone have a good recommendation for a big roller duffel capable of carrying a 5mm suit, fins, etc, plus other camping gear? This is not a duffel style but I have packed it with over 100 lbs of gear and drug it onto dive boats and it is still holding up. Scuba fins fit in the side but carbon fibers stick out a bit so I either let them stick out a bit or put them in a large carry duffel bag with other light stuff. I wish the wheels were larger but they work great rolling on sidewalks. I have one like that DG, and its been the greatest for me and my gear. Think I've had it for about 18 yrs now and its still holding up. One of the best items I bought for dive gear. 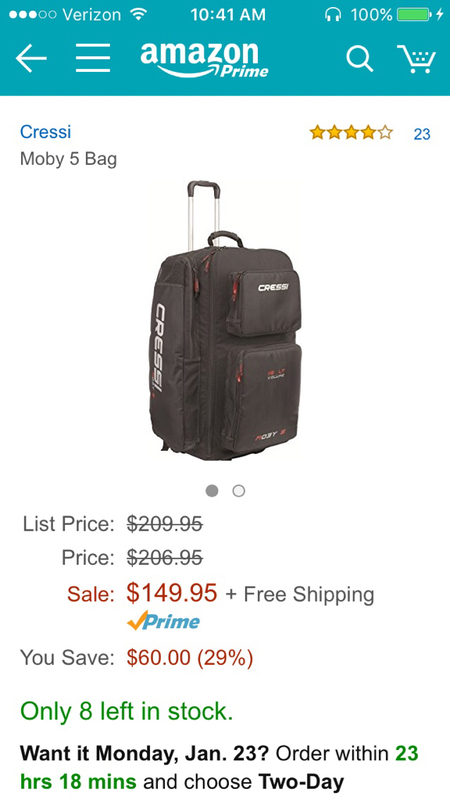 Between this and my newer sports tube I can carry everything on a plane or boat in 2 pieces of luggage. Just in case I am able to fly somewhere for a dive. Doesn't hurt that it's 25 percent cheaper now. Maybe it's an older model. Thanks! So would there be room for some other stuff if I bought this as my main bag? I'm not bringing dive floats, dive lines, etc. Just wetsuit, short fins, gloves, booties, mask/snorkel, and maybe a weight belt. Also hoping to fit my fly rod, sleeping bag, clothes and other basic items. Based on what you are saying this would work. If you are bringing longer fins and guns I would get a sports tube that expands to the size you need. I use the sport tube (middle sized one) and a cheap duffel to travel. Wheels are nice but the duffel can double up as a boat bag. If it is easily damaged, it goes in the sport tube. Be aware that the largest size sport tube is a beast. For me, the middle sized one will weigh just under 50 pounds when totally filled with guns and gear. Fins, mask, guns, etc all go in the tube.